Veriot Venture Smart GPS Tracking Device. Best for Kids, Valuables, Employees and Fleets. AT&T 3G Coverage! Real Time locations, LOWEST TOTAL COST OF OWNERSHIP. Easy to use and set up. Kids? Employees? Cars? Guitars? Track 'em in a snap! It's easy to keep an eye on what's important to you. 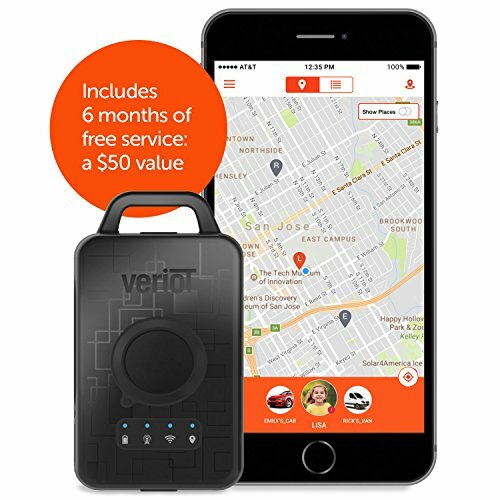 The Veriot Venture is a versatile personal GPS tracking device that keeps you connected to the people and things that matter most - from family members and valuable items to employees, vehicles and equipment - directly from your smartphone, tablet or computer. There's nothing more important than the people in our lives. Venture gives you the peace of mind of seeing if your loved ones are safely where they're supposed to be. Some things are priceless. With Venture, you'll feel better knowing your belongings are accounted for - from musical instruments, camera equipment and sports gear to cars, bikes, ATVs and boats. Running a business is all about efficiency. Venture is the ideal tracking solution for contractors, cleaning services, landscapers and other workers out in the field. Information is power when it comes to business. Venture allows you to make real-time decisions based on the location and movement of your business vehicles and other assets. TRACKING MADE SIMPLE - Keep your loved ones within reach, watch over your valuables and monitor your workers, fleet and assets. Find peace of mind with real-time location tracking and movement history, right from your iPhone, iPad, Android device or PC. UNMATCHED PERFORMANCE - Venture offers pinpoint accuracy and works nationwide within AT&T's superior network. Where other devices may offer limited coverage on legacy networks, 2nd-tier SIM cards or just Bluetooth, you are guaranteed exceptional, top-tier cellular coverage. LOWEST TOTAL COST - Venture includes 6 months of FREE tracking and offers the lowest cost and most reliable tracking on the market. Renew for as little as $5 a month. See the comparison chart in photos for details. UNPARALLELED SUPPORT - Veriot offers 24/7/365 phone and email support to ensure timely responses to your questions. The Veriot Rapid Exchange Program replaces units fast if something goes wrong and our products come with a one-year warranty on defects. OPTIMIZED FOR LONG BATTERY LIFE - Venture gives you up to 5 day battery life while in constant operation. With Venture, you get the best mix of durability and cutting-edge performance and features. If you have any questions about this product by Veriot, contact us by completing and submitting the form below. If you are looking for a specif part number, please include it with your message.